Whether you graduate right out of college or find yourself in a second (or third) career- being a new graduate nurse can be tough. You made it through nursing school, yet now you are thrown into the ‘real world’ of healthcare… which can be scary stuff! As experienced nurses working in healthcare know, the system often has its own language. Common words and phrases are often referred to in shortened acronyms. Healthcare institutions can be large, making it even difficult to find new nurse orientation itself. And with the shifts in healthcare, we do see many of the smaller organizations being added to some central ‘mother ship’ locale… which can make for even more confusion for the brand new nurse. It’s almost as if they ought to add a course in nursing school along the lines of ‘how to navigate the healthcare system’, to help new graduates prepare for their new nursing role. Because the new nurse just wants to focus on getting comfortable with patient care and perfecting their skills. So why not help new graduates make the transition an easier one? 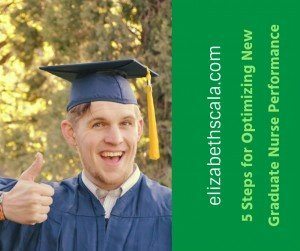 What can we do to optimize new nurse performance? Provide mentorship and guidance. Unfortunately, we still hear the term ‘nurses eat their young’. While nurses can be the most compassionate and caring people when they are taking care of patients, at times they continue to bully or intimidate new team members. Rather than dwell on why this may occur- let’s talk about what can be done about it. Provide mentorship and guidance to new graduate nurses. When we offer preceptor programs, peer support groups, and opportunities for professional development we help new nurses thrive. A good example of this is Dr. Louise Jakubik’s work with the Nurse Mentoring Institute. Louise helps support and develop nurses and nursing organizations in practice, education and management roles through mentoring. Allow for independence while promoting quality care. New graduate nurses certainly need to learn the basic skills of being a nurse. In addition to these, they also need to realize the art and science of nursing. We need to support them as they develop their ‘art’ (e.g. nursing instinct, expert assessment skills, or building rapport with patients) in their own way. However, we need to also need to be role-models in showing them what quality care looks and feels like. Each moment we are with our new graduate nurses we are presented with great opportunity for teaching lifelong lessons. Let us remember that each graduate nurse brings a unique skill to the team which, when cultivated, can be grown into a successful nurse leader. Teach patiently while you support them. New graduate nurses can feel scared. They may be terrified about asking a question and looking silly among their colleagues. We need to remind them often that questions and conversations help us grow. We must take our time as we introduce new grads to the workflow. There certainly needs to be a level of accountability, coupled with supportive guidance along the way. Let them breathe. Nursing school teaches many potential nurses about rushing around, multi-tasking, and feeling the pressure of the nursing profession. In addition to the fast action that is evident in a nursing career- we also must remind new graduate nurses that they have to breathe. They need to take time for themselves and see this as important as their brand new career. In order for the new graduate to succeed, they need a life outside of work! Practice, practice, practice. This final step is all about repetition. Let the new nurse practice the skills… both while with the patient and on their own. Encourage them to show you any of the tasks, before they go out and do it on their own. And, as an experienced nurse, mentoring the new grad to your workplace… it is crucial that you practice what you teach. If you tell a new nurse to take time for themselves, yet you don’t do it yourself… guess what? They will learn that self-care is not important. Just as children do, new nurses learn from what they see and hear… not always what they are told. OK- now it is your turn! 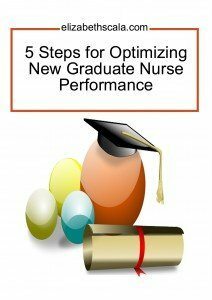 What steps do you take to optimize the new graduate nurse’s performance on the job? What do you do to help them get comfortable with this new career? Share below and thanks for reading! This is so important, Elizabeth! I imagine some nurses may feel some anxiety taking this on; worrying they don’t have the time. My suggestion is to take on just one of your suggestions for an entire shift. Focus one shift on helping them practice a new skill. The next shift, remind them to breathe, etc. The 5 steps cover so much! Inherent in each of them is this: Be KIND. New grads to be kind to themselves and for everyone coming in contact with our new grads. ‘Everyone’ includes all allied health professionals and others in the setting. Wouldn’t it be nice if we had a welcome to our new grads in the setting such as the hospital that would include all the departments- dietary, housekeeping…? It’s an exciting time and I like the idea of celebrating that very first BIG step. Great point, Carmen. Like the Golden Rule… treat others (and yourself) how you want to be treated. Thanks for adding this valuable comment to the post! Appreciate it.